Hair fall is the most common complaint among girls these days. The result of erratic schedules, junk-food heavy diets and hormonal fluctuations is seen on the comb, at the end of the day when we brush our hair. Somehow, those chemical treatments never seem to be good enough. Girls, your hair needs nourishment and gentle treatment to return to its former splendor. Rub some fresh coconut milk onto your scalp before you wash your hair. Its nutrition and moisture treat your hair at its roots, stimulating hair growth. Mix an egg yolk with some freshly prepared green tea (it’s easier to use tea bags for the green tea) and apply onto your scalp. Wash it off after an hour. The green tea is rich in antioxidants, and eggs are the best source of protein. Massage your scalp with pure aloe and then wash it off with shampoo after a few hours. Soak some methi seeds in water overnight. Make a watery paste out of these in the morning, add about half a cup of curd and one egg white and mix it up. Apply it on your hair and let it dry before washing it off. Use a serum to mask the smell. 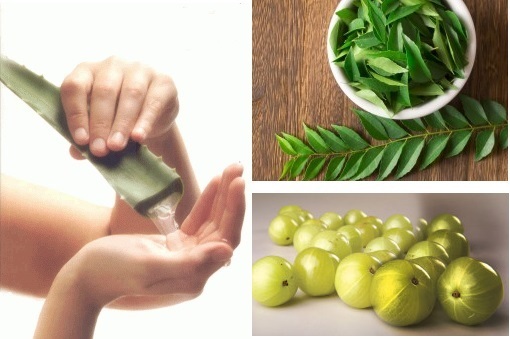 Boil neem leaves in water and rinse your hair with this mixture (once it’s cool) at least once a week. Boil amla in coconut oil and apply it to your scalp once it cools. You could try amla and shikakai but for those who are fighting hair fall AND frizz, this is not recommended. Apply very little fresh ginger, onion or garlic juice to your hair. Keep it only for a 2-3 hours before you wash it off. Rinse it thoroughly and use a conditioner with a strong smell, to mask the smell of the juices. Take a table spoon each of amla, neem and shikakai powders. You can generally find them at a store which stocks ayurvedic products. Mix them with aloe vera and apply it on your hair. Wait for an hour before washing it off. Another super effective hair pack is henna mixed with curd and 2 egg whites. Be sure to keep it on only for 10-15 mins if you don’t want henna colored hair. Don’t worry, henna will be all you can smell at the end. Take some warm olive oil, add a few drops of honey and a pinch of cinnamon powder. Massage it on and wash it off! Now fight your hair fall with more than just a regular ‘champi’ girls! 5 Brilliant home remedies for hair growth that are sure to work!